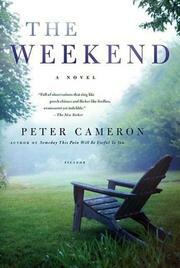  What's planned as a peaceful summer weekend instead stirs up all its participants' insecurities in this beautifully modulated novel of relationships, Cameron's fourth work of fiction (after the story collection Far-Flung, 1991). John and Marian, 40ish and filthy rich, wait in their lovely upstate New York home for the arrival of art critic Lyle, the lover of John's half-brother and Marian's very dear friend Tony, who died of AIDS exactly one year before. Lyle has in tow a new partner: a poor, young, half-Indian landscape painter and waiter named Robert who has rescued him from the severe depression that followed Tony's death. Marian is upset that Lyle would bring a last-minute mystery guest to this anniversary weekend and dinner party, which will also include an Italian neighbor, Laura, herself put out by the surprise appearance of her actress daughter, Nina. Cameron exploits these tensions skillfully while probing his characters' vulnerabilities. Marian is an anxious hostess and mother, fearful her baby Roland is retarded; the reserved John feels he is too dull for company; Lyle flounders without the support of easygoing Tony; Robert feels like a resented intruder; and Laura believes Nina has exposed her as a pathetic old woman. Yet Cameron has a light touch; social comedy offsets the introspection. After a difficult dinner, the novel's climax comes when a lovers' quarrel with Lyle prompts Robert to bolt for the city, leaving the others to some painful reassessment. Vigor and directness save Cameron's portrait of the chattering classes from preciosity; this fine storyteller is wise as well as clever.